I have to admit, I love self catering. What that is in American terms is renting a vacation home. When you are planning to visit England in particular but certainly all of Great Britain and Ireland, it is a fun and economic way to avoid the high costs of hotels. If you can happen to combine a self catering stay with a historic location, that is even better. The cottages at Sudeley Castle are just that. We have stayed there twice because we love Sudeley Castle and the Cotswolds. Sudeley Castle is located in the town of Winchcombe, Gloucestershire. Winchcombe is a very old historic town that has retained much of its medieval flavor, the streets are narrow, the shops and houses are stone it is all just too atmospheric. For a history lover, it hardly gets any better than this. 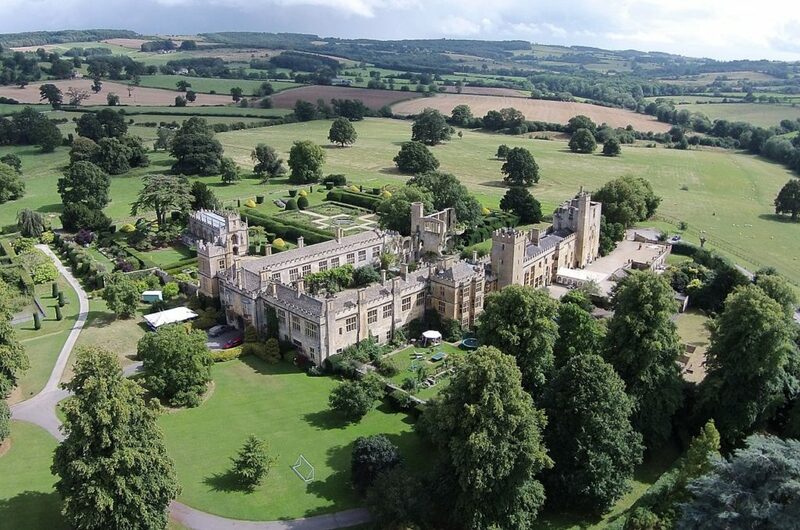 Sudeley Castle is historic for many reasons but the main reason that people come here is because this was the last home of Katherine Parr the 6th wife of Henry VIII and she is buried here. The gardens are lovely, they have great shopping, you can tour the house and gardens and it included with your stay. The cottages themselves appear to be historic and some of them have been created from older historic buildings but some are newer creations. The cottages are very snug and while they can in no way be called luxurious, they are certainly comfortable. There are several different styles to the accommodations. There are two cottages that are free standing. We stayed in the Queens Cottage on one of our stays. It is a lovely cottage with two bedrooms upstairs and one bathroom. It has a nice sized living room dining room combination and a functional kitchen. We did plenty of cooking while we were here but be prepared, there is no dishwasher, you are on your own. If you come in the warm weather you do have your own area behind the house with outdoor furniture. We however always come in the cold weather. Units come with a TV. Units also do not have laundry facilities but they are available onsite. The other unit we stayed in was the Prince Rupert which is a townhouse type accommodation that shares a deck with several other units. It also has two bedroom and living room, dining area and kitchen. There is a faux fireplace but it is for show only, too bad really. There are some units that are smaller and some that can sleep up to five people. There is a parking lot which can get crowded which is why we liked the Queens Cottage because we could park right next to our little house. It is an easy walk into Winchcombe and there is a tearoom very close. There are small stores where you can buy provisions in town or there is a large Tesco is Stow on the Wold. There are grocery stores as well in Tewksbury which is not too far away. The M5 is very convenient to Winchcombe and it can take you to many places in the west country. Winchcombe is also convenient to Stratford upon Avon and Chipping Norton. While this isn’t the most luxurious place we have ever rented, it says something that this is the only self catering place that we have stayed twice. There are some things that are more appealing than luxury and lots of amenities history is one of them. They are a three diamond property.